As part of a government-backed trial program testing the efficacy of longer trailers, United Kingdom-based grocery chain Tesco has taken delivery of 25 new 51-foot Gray & Adams refrigerated units. The company will use the new trailers to deliver store inventory from regional distribution centers. Each trailer can carry 51 cages (UK shipping units), six more than a standard 45-foot trailer. "That represents a 13-percent increase in productivity, so the potential benefits of fewer vehicle movements and lower emissions are obvious," says Cliff Smith, Tesco's fleet engineering manager. "But we've only just put these trailers on the road, so we still have work to do in terms of driver training and risk assessment at the delivery points before we come to any firm conclusions about the longer trailers." 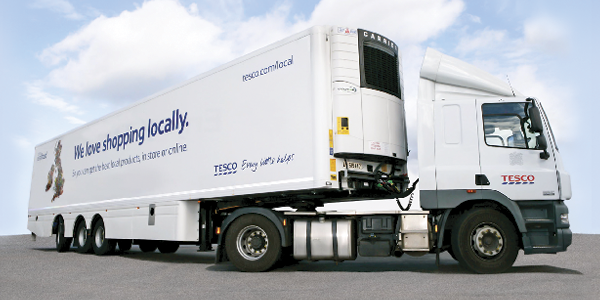 The initiative is part of Tesco's F-Plan—fuller cages, fuller trucks, fewer miles, and fuel economy. Tesco has taken 111 million miles off the road over the past five years, saving 157,000 tons of CO2 emissions in the process.